The classical trowel shape of the piece offers an exciting contrast to the modern design. In the mythical marine scene depicted, a mermaid rises from ocean depths and blows fish up the handle. Short has deftly captured the depth and lustre of the colours. The enamelling uses the basse taille technique over the engraving, beautifully integrated with the surrounding silver. The swirling waves of the engraved silver complement the marine motif and create a luxuriant, opulent feel, enhanced by the split boss fastened by three 18 carat gold screws. The piece is a successful fusion between modern design and a highly decorative classical style. The server is in the form of a trowel. The heart-shaped blade is heavily engraved on both the top and the underside with swirling waves and currents. 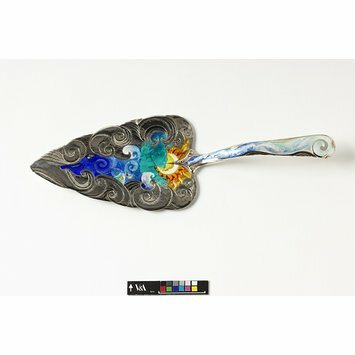 A central triangular area enamelled in blue-green depicts a mermaid rising from the deep and blowing seven fish up the enamelled and engraved handle. The blade is grasped by a split boss, triangular on top and a rounded V underneath, and fastened by three 18 carat gold screws. The underside of the blade is counter-enamelled in a deep blue-green sea. The enamelling is basse taille over the engraving. The mermaid's head is outlined by a man-in-the-moon over a gold sun; snails and shells accentuate the marine motif. Mark of Jane Short MBE. Historical significance: The artist was inspired by the richness and splendour of enamel to use fanciful imagery; a mythical mermaid. The richness of colour and imagery is complemented by the highly decorative engraved silver. Silver, gold and enamel, London hallmarks for 1992, mark of Jane Short MBE.